So you have celiac disease or are gluten sensitive and suddenly everyone arounds you treats you differently, why is that? Why does what is going on in my body have an effect on everyone else? The truth is, it will change your relationships quite a bit because you will no longer be able to do the things you have always done, things that you did today before you found out what was going on inside of you. As you learn to navigate the world of gluten out of sheer necessity, you will be forced to make choices and decisions that you will now approach differently and you will change. In truth change scares people. People who are close to you sometimes become threatened because they are afraid they may have the same issue, they are afraid family dinners/get-togethers/holidays will never be the same, they are afraid you no longer will be the you who you they know and love. It is all how you approach them and these challenges that matter the most in easing their fears. But what you first must understand is you have to face your own fears first before you can face theirs. Going gluten free absolutely has a learning curve. And, becoming comfortable with food again will take some time. It’s important to give yourself this time to get reacquainted with and reinvent your favorites. Experiment and make this a fun project. Learn to cook, if you weren’t a cook, put some music on, dance in the kitchen, watch a cooking class, cook with friends, whatever works for you enjoy the process of taking care of your health. Hating to cook just won’t work anymore, so add some things that you love to do into the mix and make it more fun. Soon you will learn to love it and make it part of your weekly routine. I know most Sunday’s are meal prep days for me, so that I have quick easy meals throughout the week when I need to grab and go, most days. It’s important not to focus on all the things that you can no longer eat because honestly that leads you down an ugly rabbit hole. Instead focus on what you can eat and learn to recreate your family favorites so that they are yummy, delicious and not harmful to you anymore. Soon you will have a pretty lengthy menu of items that you enjoy and the trick is to write down the new recipes because I often tweak mine but it is definitely helpful to get down the basics first and then try new versions, new spices, new proteins, I’m always mixing things up. And, once you get more comfortable around food and knowing what is safe and what is not, then be sure to include your family and friends. Bring your new creations to dinner parties, family get-togethers and Holidays and even host your own. The more comfortable you are around food, the more comfortable you will make everyone else and then you will be able to explain your process. Just like anything when you come from a place of fear and uncertainty it only breeds more of that in your friends and family. And, the opposite is true when you come at food with a sense of “I’ve got this” then family and friends will relax and be more receptive to understanding just what you are going through and what they can do to help make things better for you as well. 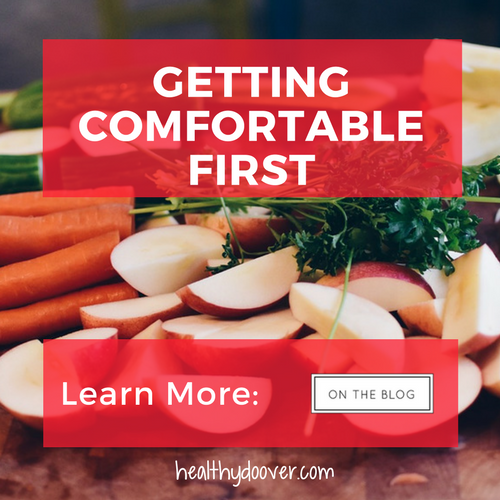 What are your best strategies for getting comfortable around food? especially when your starting out. Would love to hear your thoughts too.